Since I've been away from the blog, I've been able to get the house more settled. 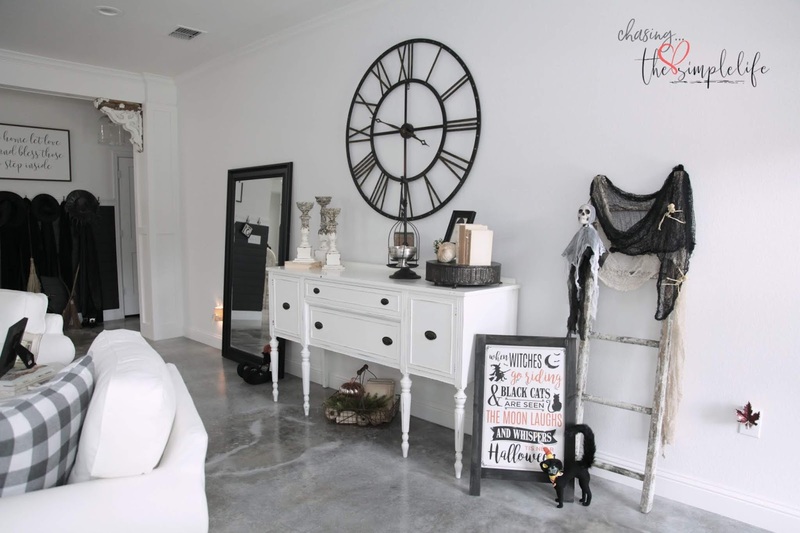 When you first move into a home it takes a little while to get a feel for things and for the house to let you know what it needs...what needs to be added and what needs to be eliminated. Prior to moving from our home in Tennessee, we sold a pretty good bit of our furniture. Most of the furniture was white and we were not sure how long it was going to be in storage. House hunting is such an arduous task! Once we closed on this house, I ordered the same chairs we had in our previous home for this home. We like them, they are comfortable and they work in this small living room space. 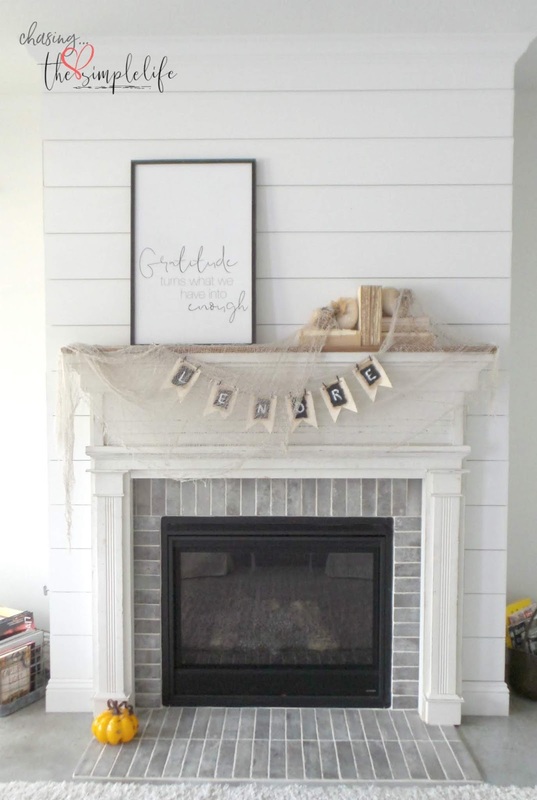 When we first looked at this house, we immediately fell in love with the fireplace. We were told it was constructed of old wood from the original state capitol building in Austin. We have no way of knowing if this is true or not, but the story lends some character to this quaint focal point in the room. The tile around the fireplace, yes that is tile...not brick, matches the flooring in the two bathrooms upstairs. And just a little bit of info...I cannot dust the top of that mantle...the wood is too rough. I have to use a lint roller on it...works perfectly! We added the shiplap to the hall wall and used a dark gray paint. 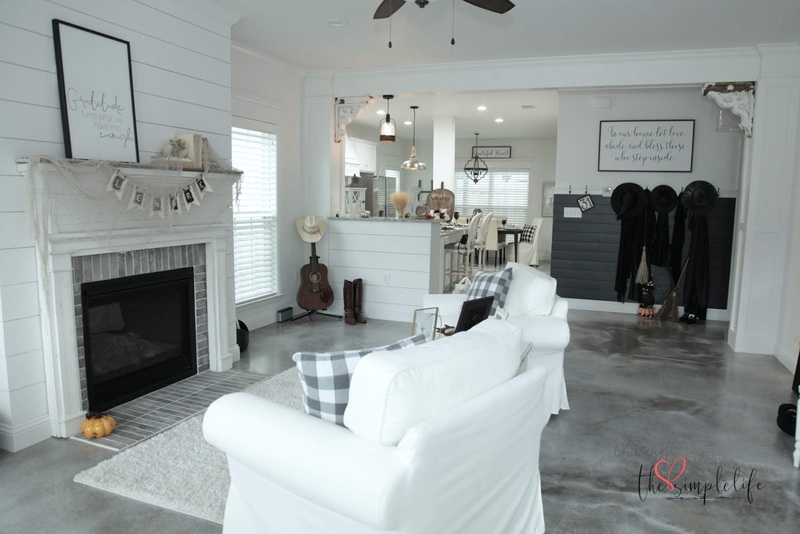 Originally, it was a plain white wall...it begged for something and was one of the few walls that did not have shiplap. Good thing we added all those hooks or the witches would have been in trouble...having no where to hang their cloaks and hats! :-) That hallway leads to the half-bath and laundry room. Laundry room pics will come later...we just gave it a facelift and it is still recovering. 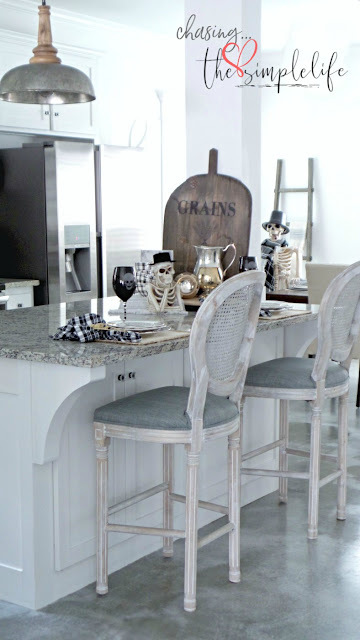 I originally had two white Ikea chairs at the kitchen island...then I found these beauties at HomeGoods. They were too tall so the hubster cut the legs down...they work perfectly and look so much better than the other chairs. 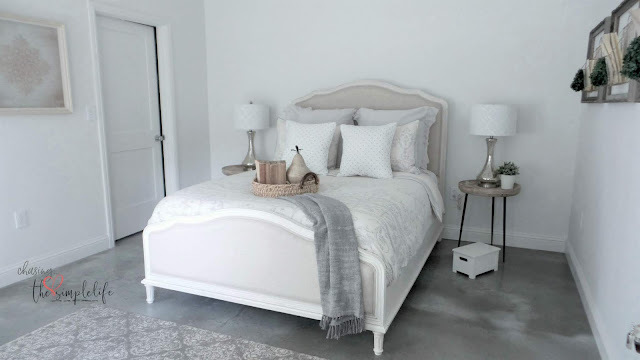 I just love this bed and had been dreaming of buying it for a couple of years! The master bedroom is still evolving. It is small and I didn't want to crowd it with "stuff" so I kept our furniture minimal in here. The wall above our bed needs something but I haven't found the right something. I will know it when I see it. We moved our original bed, which was black, upstairs to one of the guest rooms. The black just didn't work in this room at all. Our chest-of-drawers is also black but thankfully it fits neatly in our closet. I would love to change the bathroom and closet doors to sliders since they take up a lot of valuable space. Replacing the doors is on the "to do" list. Soooo, that rounds up photos of the first floor. Second floor photos will be another day when we have sun most of the day. I mentioned to you in a previous post about how our home had two different looks and personalities. Upstairs is not as light or open (and there is carpet), so you have to wait for the right light to take photos. Love love love seeing your new home. 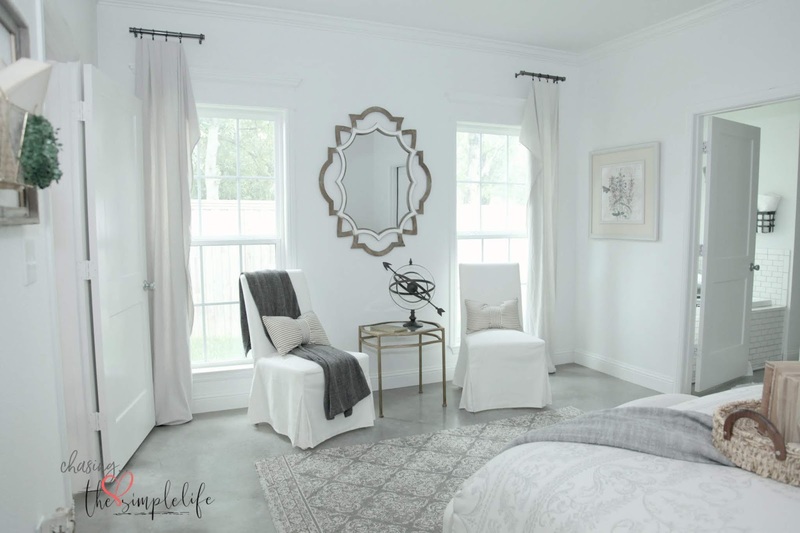 You and I love our whites and grays and neutrals! So I am swooning. I love the fireplace. I miss having one. Congrats on the magazine feature. Your home is so deserving. Happy New Week. Have a good one. Thank you so much Kris! I do love the white/grays/neutrals...it lets me change a few things out and keep my basics. The chairs are Ikea with slipcovers so anytime I want to change those out, I just order different slipcovers. I do love my fireplace. I told the hubster I wouldn't be without one again. We didn't have one at the loft and I missed it terribly! Thank you again so much! Hope you are having a great week! Love and hugs! 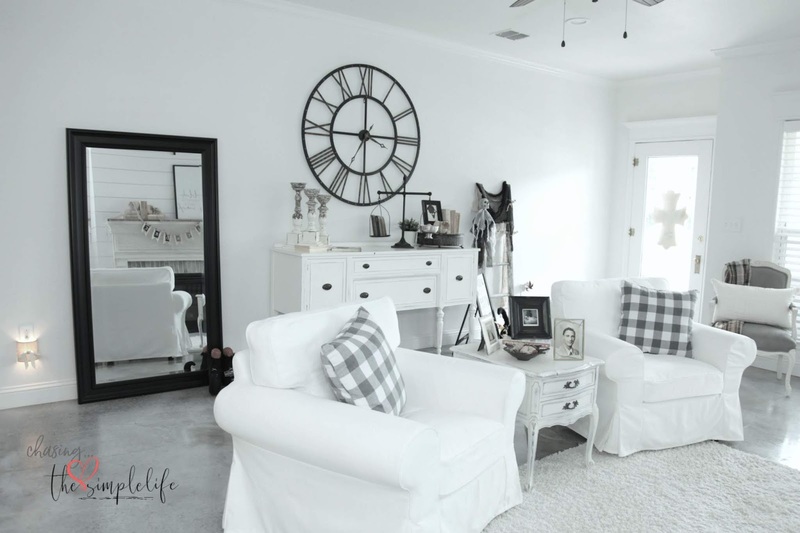 What a lovely home-the light colors look so fresh! So, you no longer live in TN? I live in west TN. I know one other home that has stained concrete floors. and I love them! she has large beautiful area rugs here and there for texture. but oh my. I always have thought the stained concrete was so unusual and special! never thought of dropping something though. We love the stained concrete floors also! They were one of the attractive things about this house. They just work here. I don't know how differently the house would look with hardwoods or if it would have been as open-looking with hardwoods or even carpet. We only have the one rug, but I'm thinking of putting a long runner near the front door. Dropping something on them is definitely a deal breaker. We do keep the denatured alcohol close by for the accidental dropping of something that stains. I won't be without it again. Some of the solutions eat right through the sealer. Most of it came out...one of the dining chairs still wears a smudge...LOL. Thank you on the shiplap. We added it because everything was too white...every wall in this house (with the exception of the ones we've changed) is white. It needed something. Thank you on the chair also...I was pleased with the outcome and I didn't have to throw it away...LOL You are too funny!! I love exclamation points...I couldn't talk without them!!! :-) Love to you sweet friend!! WOW!! WOW!! It is so lovely. I was going to ask about the floor and you shared. :-) Nail Polish, I did that on a wood floor. GULP! It did not shatter, the top was off, so still made a mess. Thank you so much Carla! Nail polish is never, ever a good thing to spill...it is a mess regardless of the surface and so painful to figure out how to clean it up! :-) Love and hugs! LOVE the Craigslist buffet find! Tell me as I've forgotten, are you back in TX now? Thank you so much! I loved it when I saw it and the best part is that I didn't have to do a thing to it...just brought it in and put it in place! Yes ma'am, we are back in Texas for a while. Love and hugs!! Your new home is lovely, Benita! I hear you on the art work, I still have naked walls in this house and I'm here 3 1/2 years! I can't buy just anything, it has to be the right piece! Thank you so much! We are enjoying it and I’m glad we will be here a while! When we moved out of the house in TN, I had not put all of my things on the walls and I had one bedroom that was completely empty…LOL. I made sure I put things on the walls quickly here, but there are some areas I just don’t want to rush…especially our bedroom. So, until I find the right things, some walls stay bare. Love and hugs! Very very pretty! That floor is fantastic and sets the mood for everything you have. Love it all! Thank you so much AnnMarie! And you are exactly right...that floor set the entire mood for the decor of this first floor! I can't imagine a different floor down here...the concrete just works. Thank you again! Love and hugs! Benita, this is so pretty! I am in love with all the white and wood touches around the room. I thought those were concrete floors - super nice! I admire your ability to move, let go of former furnishings, and then be able to start fresh. I may be doing that in my near future and I could certainly use a tutorial. I very much agree that a house needs to be lived in a bit before it all comes together, like your moving the master bed upstairs. Looking forward to seeing the rest, and I like your restraint in putting out a lot of stuff. I could also use a tutorial on that front. Thank you so much Rita! We do love these concrete floors! Moving as often as we have as allowed us the opportunity to step back and decide what is worth keeping in storage to reuse and what is worth selling. When you figure up all of the expense, sometimes it is less expensive to buy something else if you know it is going to sit in storage (racking up dollars). I used to have a lot of “sit around” things, but after packing and hauling all that stuff around, it is very easy to purge and pare down. I remember those boiled eggs exploding in TN! I love that buffet! I would fight over that buffet and I have a perfect place for it If I were to sell my vintage magazine collection and the giant cabinet that houses all of them, an idea for someday. Your fireplace is absolutely lovely but what I'd really steal are those corbels in the opening to the kitchen. Did they come with the house or did you add them? You have accomplished so much and I hope you tell us lots more when the pictures appear in the magazine! Honey, that was such a mess…and don’t tell the hubster, but it has almost happened here…LOL. I caught them just in time! Thank you so much! I fell it love with it when I saw it for sale and contacted the girl immediately. We went to pick it up that afternoon because I was afraid she would sell it to someone else. It wouldn’t fit in my Kia and we had to finagle that thing in. It was a tight right home…LOL The corbels came with the house. They did a really good job on most of the design elements here…only a few things we didn’t like and we are working on changing those. We’ve already changed some light fixtures out and will be changing a few more. Next September is the publication date and the photo shoot will be in a couple of weeks. I will keep you posted! Love you! Your home is perfect and congratulations on the photo shoot. How neat is that?! We love that movie also and every time we have to pack up to move, it becomes our theme song...LOL. Thank you so much sweet friend! We are excited and I'm a nervous wreck at the same time! LOL Love and hugs to you!